General Information: Five 2 3/4" golf tees and two golf ball markers in a Velveteen Draw..
General Information: Golf Ball Tube: 9 2 3/4" Tees, 1 Golf Ball Tees: 1 Colo..
General Information: 8 2 3/4" golf tees, 1 ball marker and 1 divot fixer in a Velveteen ..
General Information: Golf Ball Tube: 9 2 3/4" Tees, 2 Golf Balls Tees: .. Creating custom golf tee packets is a great way to set yourself apart on the course, or just add a personal touch to the game. 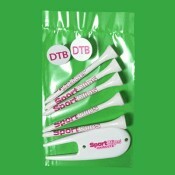 However, our golf tee packets are the perfect promotional item as well, not to mention gift. With different combo options and the ability to personalize golf balls, tees, and markers, creating a tee packet for your business or as wedding favors is a great option. Within our custom golf tee packet options, you can choose from polybag combos, matchbook packets, and golf tee tubes—which have the option of adding 1 or 2 golf balls (also customizable). The polybag combos can include your custom golf tees only, tees and a personalized ball marker, or tees, markers, and fixers—all with your custom logo or text. Matchbook packets offer the same options, yet the packet can also display your logo! No matter the option you choose, your custom golf accessories will be completely unique to you or your business. Better yet, adding your logo and personalizing the items is a breeze with CMGE. Once you select your item, simply upload your logo or text and use our design tool to make adjustments. Once complete, we can send you virtual proof of your designs to ensure they come out as expected. Keep in mind, you’re never restricted to our custom golf tee packets. 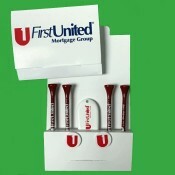 You can bulk order your own golf tees, professional-grade golf balls, and a range of customizable accessories. Do it all right here at Custom Made Golf Events.